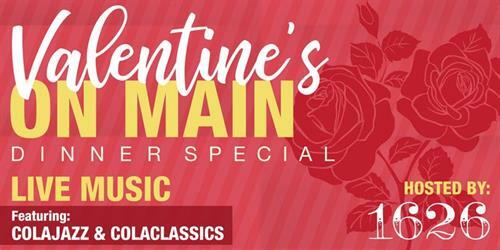 Valentine's on Main - Feb 14, 2019 - Partners - Columbia Chamber of Commerce ? A Valentine's Day Affair on Main. Celebrate love as we enjoy a night of food and live music with ColaJazz & ColaClassics, plus Executive Chef, Mike Ellis with Topgolf Swing Suite is preparing a delicious meal for you. Our "CUPID" Couples (2) tickets ($100.00) "Cupid" Single (1) ($50.00) will include; live music, *one appetizer to share, one entrée each, one enticing *dessert to share and one drink ticket each for house wine, beer, or house liquor. Chef Mike is offering an over-the-top selective menu for this night and 1626 Main Street, Columbia, SC is where love and music will be happening this Valentines Day for sure!